How did you first learn about post-graduate service? For me it all started with a google search. I knew I wanted to give a year devoted to service, I just did not know where to start. Google brought me to the Catholic Volunteer Network where I was able to narrow in my search. What other options were available to you, and why did you decide on MercyWorks? When I was deciding what was next I was between graduate school, a full-time job, and a year of service with MercyWorks. 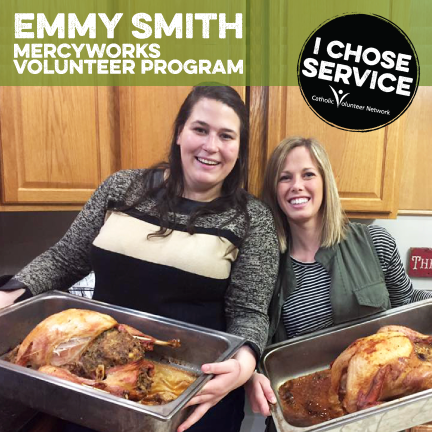 I chose MercyWorks because I wanted the chance to be challenged through experience. I was excited to live in a community invested in values that I cared about. Mostly, the professional development that a year of service offered was monumental to any other opportunity I had. Tell us about your service experience. My placement with MercyWorks was rooted in the heart of Chicago where I got the opportunity to work with young men age 11-14 at Mercy Home for Boys and Girls. My role as a youth care worker allowed me to meet youth where they were at to give them the best possible therapeutic treatment for them and their families. I got put on a team of hard working, dedicated men and women who were truly inspired by the mission of Speh Home, “ to give wings to Chicago’s children.” Throughout my experience I walked with youth through their daily struggles, successes, and moments of growth. Placement wise, I could not be more thankful for choosing service. There is a certain joy that comes with working with middle school boys that is only available through experience. I got to experience this joy every single day while serving in Speh home. One of my favorite examples of this joy was when one of my youth would ask for a bedtime story and to be tucked in every night. Another when another wanted to create a secret hand shake that has now grown to be 215 steps long. The boys I served made it easy to want to continue coming to work every single day. As for my volunteer community experience, I could talk forever about how fortunate I am to have experienced this service year with eleven of the most courageous, dynamic, and servant leader companions. Moving far from home, I did not know what to expect. It was evident from our opening ceremony that we were going to have an amazing year. The men and women I served alongside challenged me daily to grow into my best self. They encouraged me always to shoot for my dreams. Mostly, they supported me through any struggled that happened throughout my year. I am so thankful I chose MercyWorks for giving me a community for life, not just for the year we were serving. What benefits have you gained from this experience that you might not have received otherwise? Through this experience I gained monumental personal, profession, and spiritual growth. Mercy Works truly cared about us as individuals and set me up with a network of support. I was giving a professional mentor, spiritual director, as well as the ability to network in the heart of Chicago. MercyWorks made sure to set me up with any opportunity that could help me grow or challenge my perspective, it was my job to say yes to their invitations. I look back at this year and did not know what to expect for professional growth. I am finishing this year with a better understanding of who I am professionally, and what my aspirations are as well as a network to utilize as a begin to search for what to do next. What advice do you have for someone considering post-graduate service? Do it! Do it because every single service program will allow you to flourish in ways you never thought possible. I know that it is scary the idea of not getting paid, especially with the external pressure to make money and pay off debts. However I want to challenge you and ask, how many things worth doing haven’t had a component of being scared? Any program you pick will be paying you in a priceless experience, professional growth, and personal development. You owe it to yourself to be stretched, changed, and to experience God through service.